After the earthquake in Haiti, many of us felt sick at the heart, unable to move. Dear Julie Van Rosendaal started doing something. She asked us to help. Of course, we said yes. Less than three weeks later, Julie made miracles happen. With the help of a talented artist, printing partners West Canadian Graphics and Blurb, and mostly the indefatigable efforts of Julie Van Rosendaal, BlogAid the cookbook, was born. Julie gathered 27 food writers from around the world to offer recipes, photographs, and stories. We all felt helpless in the face of Haiti’s disaster. We gave the best we know how. Besides a chocolate chip cookie recipe from me and Danny, this gorgeous cookbook also includes recipes from Chef Michael Smith, Dana McCauley, Emily Richards, Catharine from Weelicious, Cheryl from Backseat Gourmet, Jeannette of Everybody Likes Sandwiches, Nishta from Blue Jean Gourmet, Lauren of Celiac Teen, Charmian from Christie’s Corner, Shaina from Food for my Family, Marisa of Food in Jars, Lauren from Healthy Delicious, Alice from Savory Sweet Life, Tara from Seven Spoons, Jess of Sweet Amandine, Helen from Tartelette, Gail from The Pink Peppercorn, Pierre of Kitchen Scraps, Tim from Lottie and Doof, Tea from Tea & Cookies, Jamie from My Baking Addiction, Lori from Recipe Girl, Melissa from The Traveler’s Lunchbox, Brooke of Tongue-n-Cheeky and Aimee of Under the High Chair. This beautiful 110-page cookbook came together so quickly that it makes my head spin. You might think, therefore, that it would be a little wonky. Well-intentioned but mimeographed and stapled crookedly like a PTA cookbook. Nope. If you click on this link, you can see a preview of the book. (Choose hardcover or softcover. Either one will offer you a preview.) It’s such a beautiful book. There’s more. This is almost even more stunning. The good folks at West Canadian Graphics and Blurb are so moved by this project that they are matching the dollar amount of the proceeds raised up to $10,000. On top of that, the Canadian government will match the total amount of money raised until February 12th. 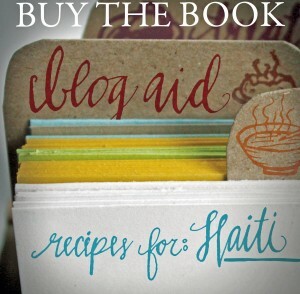 All profits for the book will help the Haiti relief fund via the Red Cross and Doctors without Borders. That means you need to buy a book now, if you can.